RIPPED FREAK® is a Hybrid Fat Burner! It’s called a Hybrid Fat Burner becaues it combines multiple mechanisms of action in one unique formula. 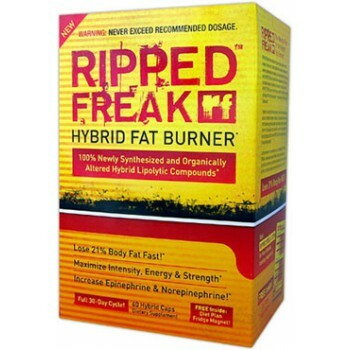 RIPPED FREAK’s Hybrid formula addresses key fat loss mechanisms in the body! Best before is 07-18. Prices reduced accordingly. With so many new research findings every year, it's hard to keep up-to-date with the latest in supplement science. That being said, if your goal is to develop a ripped-to-the-bone physique, then the right supplements can go a long way in helping you maximize fat loss! So, what are some of the most effective fat-burning compounds currently available on the market? Well, the latest research is pointing directly at some newly created ingredients called "hybrid lipolytic compounds." You're probably wondering what the heck are "hybrid lipolytic compounds" and how are they going to help you increase fat loss? Well, read on and get the inside scoop on this latest innovation in fat-loss supplementation! What Exactly is a Hybrid Compound? "Hybrid Compound" is a term that's been coined by a team of leading pharmaceutical and organic chemists working in the sports supplement industry. A hybrid is defined as a compound derived from nature that's been organically altered or synthesized to deliver more powerful effects! The first class of hybrid compounds ever created is a group of fat-loss ingredients that have been bonded to the methyl gallate ester. When bonded to established fat-burning ingredients, the methyl gallate ester provides several key advantages! The methyl gallate ester increases the effectiveness of ingredients in two unique ways, (1) it increases their bioavailability, and 2) it extends their active half-life in the body. You see, the introduction of a methyl group to a fat-burning compound has the ability to increase its lipophilicity. In laymen's terms, this means the compound has a greater ability to penetrate fatty membranes. Since the biological membranes (walls) of all cells in the human body are made up of fat the methyl gallate ester will increase the absorption of ingredients into target cells resulting in greater fat loss effects! The methyl gallate ester also increases the bioavailability of ingredients through another distinct mechanism. It has the ability to inhibit the enzymes responsible for compound biotransformation in the gut. As you may already know, many supplements are degraded in the stomach immediately after they're ingested, so they have little (if any) affect on fat loss in the body. Since the methyl gallate ester inhibits degradation of ingredients in the gut, they can be more effectively absorbed and distributed throughout the body to their target tissues. This means more powerful effects and a greater impact on total fat burning capacity! PharmaFreak Technologies Inc. is the first company to introduce "hybrid lipolytic compounds" to the market with the launch of RIPPED FREAK™. The PharmaFreak R&D team is the first to discover the benefits of using the methyl gallate ester and have combined it with key fat-burning compounds found only in the RIPPED FREAK formula! On top of that, the RIPPED FREAK formula also contains five newly discovered methylated derivatives of (-)-epigallocatechin-3-O-gallate (EGCG) from green tea extract. As already explained, the methyl groups increase the lipophilicity and absorption into target cells, making the five EGCG derivatives found in RIPPED FREAK superior to the regular form of EGCG found in all other fat burners! Now that you understand the latest research behind these unique hybrid-drug compounds you'll definitely want to include them in your fat-fighting arsenal. Just remember, RIPPED FREAK is the only product on the market that contains the methyl gallate esters - don't be fooled by cheap imitations or knock-offs! Give RIPPED FREAK a try. After just one dose you'll quickly begin to realize just how powerful it really is! When to take: Take one serving first thing in the morning / 30 minutes before your workout. If you do have a second serving, take it mid afternoon / 30 minutes before your workout. Ripped Freak is very powerful, so we recommend to only take 1 capsule per day. Work up to 2 pills after a week if you feel the need. Recommended to drink 2.5 liters of water a day and to avoid extra caffeine within a few hours of consuming. This supplement is designed for people doing proper exercise and is to be taken before exercise. Not recommended within 6 hours of sleeping. Read the instructions clearly and follow all warnings. Not intended for users under 18. Certian ingredients may not be allowed in some sports organisations.